Portability and Conversion refer to the continuation options provided to an individual when they will lose or change group coverage due to a qualifying event. These insurance options allow an individual to keep insurance even after leaving the group. Learn the step-by-step processes of how port and conversion are conducted, common pitfalls that threaten carriers, and solutions to these problems that ensure a seamless transition for the end user. Success with this aspect of plan administration allows carriers and plan sponsors to recoup revenue that otherwise would be lost. Here are four essential "must-reads." Get an overview of what this process entails and what it means--in terms of revenue--for insurance companies. 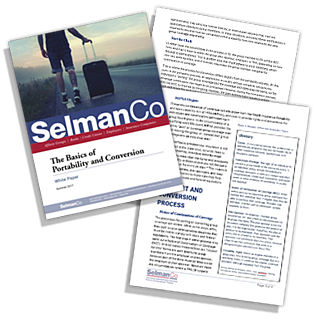 White Paper: "The Basics of Portability and Conversion"
In seven pages, you'll learn what this is, how it works, and why it's important to your business to get a handle on managing it. Tracking who’s in and who’s out is easy in a game of “Tag.” It’s much more difficult to track when it comes to group insurance plans, and that’s why we’ve evolved a unique approach to the problem. Learn how we increased the ratio of received applications to approved/issued coverages, as well as increased premiums collected for ABC Insurance Company. Selman & Company is contracted by insurance partners to perform various outsourced administration services related to insurance port and conversion. We process thousands of records as part of our outsourcing business to help our customers retain premium that could otherwise be lost. Thus, portability and conversion business is an important revenue retention tool for an insurance carrier—if done correctly. Read "The Basics of Portability and Conversion" to learn the common pitfalls that threaten carriers.